^ Streelman, Erick (Feb 2015). "A Crash Course on Pass Protection". Win With The Pass. Retrieved 22 January 2016. ^ David Romer (February 2003). "It's Fourth Down And What Does The Bellman Equation Say? A Dynamic-Programming Analysis Of Football Strategy" (PDF). Retrieved 2014-06-04. It is primarily used to run the clock down, either at the end of the first half or the game itself, in order to preserve a lead or a win. Although it generally results in a loss of a yard and uses up a down, it minimizes the risk of a fumble, the quarterback is generally not touched and the act of intentionally taking the knee results in the play being over in all variations of the sport. Also, a player is lined up directly behind the quarterback and this players responsibility is to tackle any defensive player who may recover a fumble and attempt to advance it. Because of this essentially defensive responsibility, the tailback in this formation may actually be a safety or other defensive player who is adept at making tackles in the open field. Even though the play itself takes very little time, the rules of American football dictate that it does not stop the game clock. The play is known as a victory formation, as it is most often run by a winning team late in the game in order to preserve a victory. In terms of statistics, a kneel by the quarterback is typically recorded as an attempt for –1 or –2 yards. 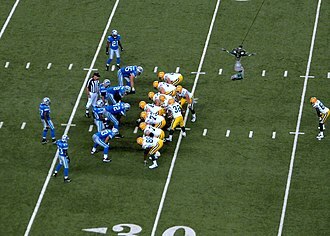 The quarterback kneel is mainly used when the team in the lead has possession of the ball less than two minutes on the game clock. A team cannot run more than three consecutive quarterback kneels as doing so on fourth down turns the ball over to the opponent and guarantees them at least one opportunity to score. The decision to run the quarterback kneel depends on the amount of remaining in the game, the down. The quarterback kneel is used at the end of the first half by a team which feels they have little chance of scoring before halftime due to poor field position. It is run at the end of the second half of a tie game by a team content with sending the game into overtime. A team that is in range and either tied on the score or trailing by 1 or 2 points can use one or more kneeldowns in order to run time off the clock before attempting a field goal. Ideally, the clock would run out during the field goal attempt, in rare instances, a team will use the quarterback kneel to avoid running up the score in a lopsided contest, even though there may be significant time remaining on the clock. 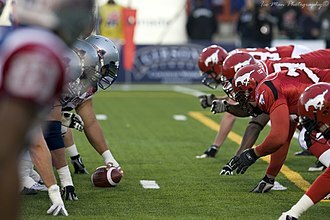 A snap is the backwards passing of the ball in American and Canadian football at the start of play from scrimmage. 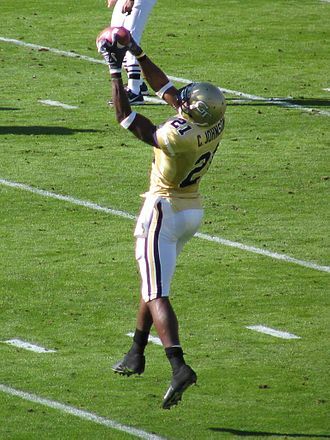 A player, the Center, delivers the ball to player. The Center may hand, throw, or even roll the ball to the other player, the snap must be a quick and continuous movement of the ball by one or both hands of the Center, and the ball must leave the Centers hands. The various rules codes have additional requirements, all of which have the effect of requiring the ball to go backwards to a player behind the line of scrimmage, the Center is almost always the center. 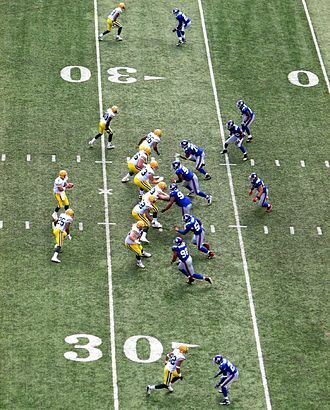 The Center almost always passes the ball between his legs, but only in Canadian football is that required, additional rules apply regarding the positioning and stance of the Center as one of several line players in anticipation of the snap. 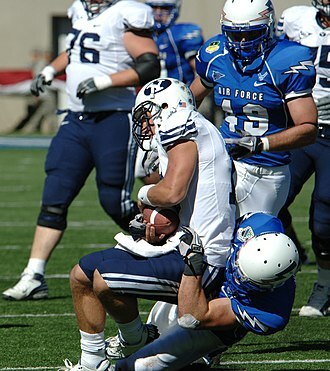 For a handed snap, the Center will usually have his head up, for a thrown snap, especially in formations wherein the ball may be snapped to players in different positions, the Center will commonly bend over looking between his legs. However, in professional football it is common for a center to be able to practice a single shotgun formation thrown snap enough to keep his head up, in the National Football League, the snap is considered a backward pass and not a handoff. Since the loose ball was a backward pass and not a fumble, any player could pick up the ball and advance the ball—if it were a fumble. Therefore, they have an advantage over their opponents. The snap count is decided on in the huddle, usually expressed as. 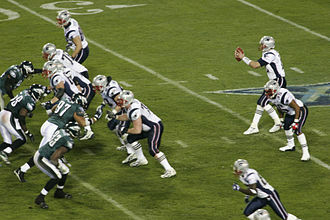 on <number>, being the final words spoken by the quarterback after calling the play but before the huddle breaks and the players go to the line of scrimmage. The snap count allows offensive players to have a head start. By varying the snap count, a quarterback forces the players to react to the movement of the offensive players. Unfortunately for the offense, this advantage can sometimes become a disadvantage, when faced with an exceptionally loud stadium, players may be unable to hear the snap count, and are forced to concentrate more on visual cues, or risk false start penalties. Single set back is an offensive base formation in American Football which requires only one running back lined up about five yards behind the quarterback. There are many variations on single back formations including two tight ends and two receivers, one tight end/three wide receivers, etc. The running back can line up directly behind the quarterback or offset either the side or the strong side. Washington Redskins coach Joe Gibbs first began using the single-back as an offense in order to move defenders off the line of scrimmage. He then began utilizing sets of two ends as blockers mainly to protect his quarterbacks from Lawrence Taylor. He believed having an extra blocker on the line would make it easier to keep Taylor out of his backfield. By using different formations and motion before the ball was snapped, the effectiveness of the formation is further increased if the team has athletic tight ends with good pass catching abilities, thereby increasing the versatility of the formation. It is, good for bootlegs and reverses, a nearly obsolete variant is the offset singleback set, in which the running back is offset behind a tackle or a guard. In this look, the back would usually be closer to the line of scrimmage than in a standard singleback look. This generally would be on 3rd downs or other passing downs, the back could catch a pass or take a handoff, using mechanics similar to that of the pro set. As shotgun became more popular, teams began utilizing this back placement with the quarterback in the shotgun instead of under center, in shotgun singleback, the running back therefore stands about the same distance from the line of scrimmage as his quarterback. However, traditional offset singleback formations are run on rare occasions. This look has been utilized on rare occasions most recently by the Miami Dolphins, single-back offenses have gained popularity due to zone blocking and advanced defenses. There are several combinations of single back formations that are used in Division 1, speed offenses will use single back because the defense still has to respect the run out of these formations since you can line up many tight ends and still have a down field passing game. 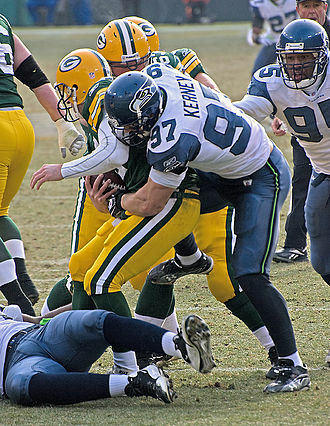 Center is a position in American football and Canadian football. The center is the innermost lineman of the line on a football teams offense. The center is the player who passes the ball between his legs to the quarterback at the start of each play, in recent years, the importance of centers for a football team has increased, due to the re-emergence of 3-4 defenses. According to Baltimore Ravens general manager Ozzie Newsome, you need to have somebody who can neutralize that nose tackle, if you dont, everything can get screwed up. Your running game wont be effective and youll have somebody in your quarterbacks face on every play, the centers first and primary role is to pass the football to the quarterback. This exchange is called a snap, most offensive schemes make adjustments based on how the defensive line and linebackers align themselves in relation to the offensive line, and what gaps they line up in. Because the center has a view of the defensive formation before the snap. This call is typically based on the position of the linemen or linebackers in his gaps. In some cases the center may call an adjustment for the offensive line. This was taken to an extreme by the Indianapolis Colts in the early 21st century, the center is therefore usually the most intelligent player on the offensive line, which is critical to a centers success. After the snap, the center performs blocking assignments, the blocking assignments vary by offense but typically consist of the following, Run blocking assignments will vary based on the current play and the defensive formation when the ball is snapped. Typically, these assignments consist of the following, Blocking middle or backside linebackers in certain formations, assisting guards in their blocking assignments. This may be a center/guard double-team where the center and guard are assigned to the target to get extra push or drive. Assistance may be just a quick hit or chip to throw the player off balance and help the guard to execute his block. Backside blocking of defensive tackles for pulling guards, in some offensive schemes, certain plays will involve pulling an offensive lineman to block for the ball carrier. Tom Brady in the shotgun at a Super Bowl. Glenn Scobey "Pop" Warner at the University of Pittsburgh in 1917. 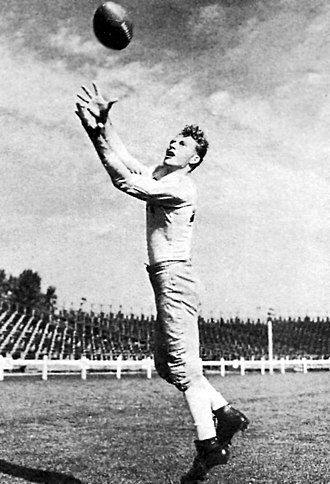 Maryland quarterback Jack Scarbath tallies the first score in the 1952 Sugar Bowl on a successful quarterback sneak. Roger Staubach, the thrower of the game-winning touchdown pass to wide receiver Drew Pearson during a December 28, 1975 NFL playoff game between the Dallas Cowboys and the Minnesota Vikings. The "Waggle" play from the Delaware Winged T offense, here shown from "Red" formation, is one type of bootleg. The quarterback fakes hand offs to both the halfback and fullback before rolling out with the protection of both guards. The quarterback then has the choice of passing or running the ball.